Every now and then something unexpected hits you in a way that leaves a deep and lasting impression. 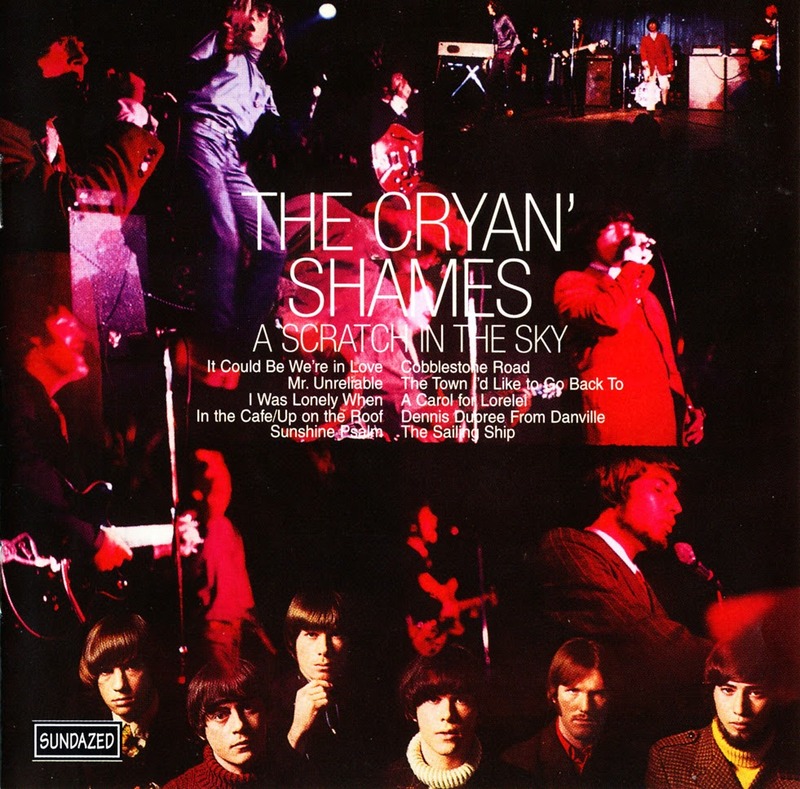 For me, one of those occasions came with Chicago garage band The Cryan’ Shames’ recording of the old Drifters hit “Up On the Roof,” off their incomprehensibly under-appreciated psychedelic classic A Scratch In the Sky. Granted, “Up On the Roof” itself has been overplayed to the point of nausea since it first made the scene back in 1963, but the Shames take the old Tin Pan Alley standard and turn it into a soaring, tightly woven piece of teenage magic that does not waste a second out of its three minutes and twenty four seconds. It’s the sound of youthful rebellion and romantic angst woven into a thing of panoramic beauty. As a matter of fact, I reckon that the record that this song is buried in is itself well-defined by the above platitudes. A Scratch In the Sky is one of those rare records laid down at the height of the sixties which manage to pull in the best qualities of the band’s many influences and turn back out something wholly unto its own. The cosmic harmonies of the Beach Boys, the jangling spirit of The Byrds, the rollicking pop of The Beatles; these are all commonly borrowed sounds, but rarely ones so expertly disassembled and recast as we hear on this record. Though this collection of songs remains well-polished through studio-craft and the musicians’ own abilities, it retains a freshness and noncommercial edge that makes it both an accessible and adventurous listen. The second track, “Sailing Ship,” is a good example of what I mean by all this. There are all sorts of influences detectable here, but nothing absolute. I never fail to be impressed by the thundering drums, jagged guitar chords and droning bagpipes here, all of which make the song sound strangely ahead of its time, or at least out of its own time. In true Sgt. Pepper fashion, the band clearly strove to make each song stand out as a distinct work of art, rather than sounding like something they had simply worked up on the road. The arrangements are ornate and layered with lysergic sounds and tape tricks, and besides the previously mentioned bagpipes the band manages to bring in accordion, harpsichord, tamboura, french horn, and…french lyrics (on “In the Cafe,” of course). If there’s any song reminiscent of the band’s work on their previous record, Sugar and Spice it’s the hard grooving “Mr. Unreliable,” which retains a lot of the garage band attitude and sweet harmonic edge that painted earlier jewels like “Ben Franklin’s Almanac”. I’m rather blown away to find that the 2002 Sundazed reissue of this record has already dipped back out of print, leaving it perhaps the hardest of the Shames discs to track down. Should the following tracks catch you like they caught me, however, you shouldn’t have to fork over too much for a vinyl copy. It seems strange that so many new reissues end up becoming more obscure and desirable than vintage releases of the same recordings, but I suppose that’s the way it goes. All songs by Jim Fairs, Lenny Kerley unless as else stated. The link part 2 is not running, please could you upload it again? thanks.